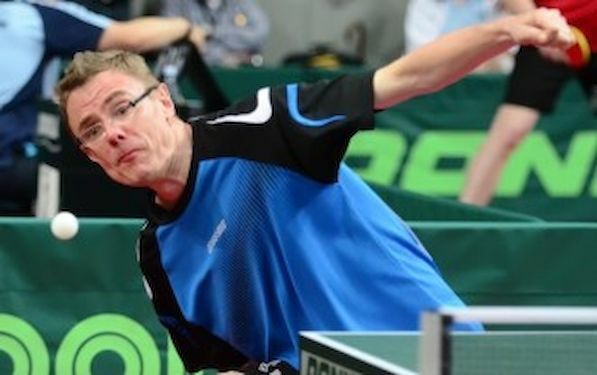 Martin OLEJNIK from Czech Republic and Russian Dmitrij MAZUNOV have expectedly entered the men’s 40 semi finals of the 2013 European Veterans Championships in Bremen. OLEJNIK, 2012 runner-up of the World Championships, will face Mukhamed KUSHKHOV from Russia. Former bronze medal winner at World Championships, MAZUNOV, plays Thierry MILLER from the Switzerland. “All good things come in threes”, did not apply to Steffen FETZNER. The 1989 World Doubles Champion saved 4 match balls in the round of 128 (Mulid KUSHOV from Russia) and was already down 0-2 games down 1 round later against Frank KASISKE from Berlin. Facing Michael O’DRISCOLL from England in the round of the last 32 he lost his powers. “In the 3rd five-games match in a row I was missing my concentration at the end,” FETZNER stated. Beyond that Michael players some very good balls”. Germany versus the top favorites – that’s the headline in the Men’s 50. Former World and European Champion Mikael APPELGREN as well as four-time Olympian DING Yi from Austria are still in the race as the top-seeds. In the semi-finals they play to Germans: former six-times national champion Georg BÖHM and multiple national veterans champion Manfred NIESWAND. Both won their quarter-finals in 5 games. In the semis on Saturday APPELGREN duels BÖHM, DING Yi plays NIESWAND.